When you are looking at the principles of floral design, you will notice that there are 7 basic principles that you can easily follow and understand when creating your own floral designs. These principles include balance, proportion, dominance, rhythm, contrast, harmony, and unity. Each of these simple principles helps to make the best floral designs possible. The basic principle of balance is easily achieved through providing your floral design with a sense of stability all the way around the design. There are two types of balance when working on floral design, physical and visual balance. Physical balance means that your design isn’t going to literally fall over while visual balance provides a sense of balance in your design. 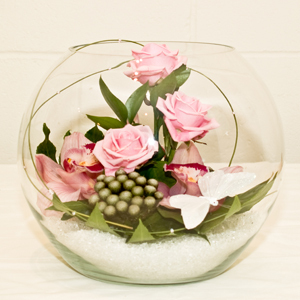 You also have symmetrical, asymmetrical, and radial balance which will give your floral design a unique appearance. Symmetrical balance means that you repeat your floral arrangement on all sides of your design as to where asymmetrical balance provides a diagonal axis that you work from giving your design the look of unequal weight. Radial balance is unique as it takes on the shape of a star-burst, spokes on a wagon wheel, or the appearance of the sun. You will need to focus on the proportion of your design to the size of your container. Your design should not be smaller than 1 ½ to 2 times the size of your container in height or width. This will also help you keep the balance of your design. While it seems complicated, it really isn’t. Just don’t make your design higher or wider than the container that you place it in and you will be fine. Scale is a big part of keeping the proportion of your floral design and will also help you find the right location for your floral arrangement as well. In simplicity, it should fit the surface that you are placing your arrangement on. 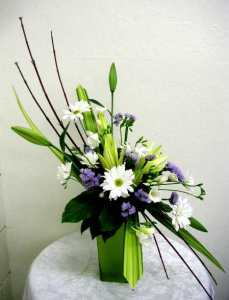 For example, if you are making an arrangement for someone who is sick in the hospital, all you need is a small arrangement as the space that the person will have for the floral design will ultimately be limited. But if you are making floral designs for a church you will need really large floral designs to allow for the perfect view from as far back as the last pew. This provides you with the perfect proportions for your floral design. When we speak about dominance in your design, you are focusing in on a specific element in that design. If you are focusing in on colour then you will need to emphasize that colour to make the other colours subordinate to your dominant element. This means to put emphasis on this element so it properly attracts the eye. When you decide on the placement of your dominant element, consider the focal point that you want to focus the eye of the viewer and place the centre of gravity for the arrangement. You can highlight this simply by making this element different from the rest of the design. Accenting is an easy way to do this and doesn’t have to be a flower in your design but something as simple as a bow on your container or combining the arrangement with a figurine that adds a little dash of something extra. While you want to make your focal point more dominant than the rest of your design, it is important to include a subtle rhythm as well to blend it into the design. 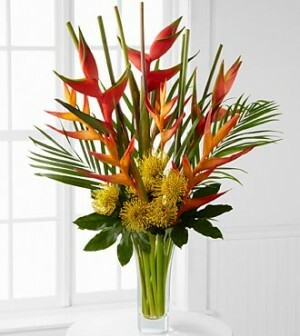 Rhythm in floral design, like in music, is very important. It regulates the flow and movement of your design through repeated patterns like the beat of your favourite tune. The goal in rhythm is to make a pathway for the viewer’s eye to follow throughout the design. This can be achieved through depth by overlapping and angling flowers as well as placing a mixture of bright and dark flowers that create a dark appearance on the bottom of your design and lighter towards the top. Repetition is another way to achieve rhythm and is easily done by creating simple patterns through your design. When focusing in on pattern through rhythm, you will need to look for a way to ease the transition from one or more of the varying degrees of elements. You can do this a variety of different ways such as alternating light and dark colours and creating a sense of contrast providing your floral design with a rhythm. 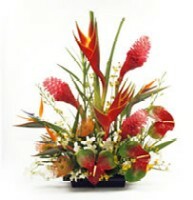 Contrast helps to create an emphasis on one or more elements in your floral design. Contrasting between elements by calling attention to elements that are completely different from one another. For example the way that black relates to white is the perfect idea of opposition. Tension is another way to imply or suggest the idea of energy. This can be done one of 4 ways, polarity or drawing things together, knotting a leaf, adding in a new bulb, or the idea that something is ready to snap or spring. Variation also creates contrast through dissimilarity or diversity among the elements that you have used. You can do this by creating the stages of development or using the same colour flowers that are different species or types of flowers. Another way to do this is by using lighter and darker colours that create a harmonizing feel to the overall arrangement and design. This can be the principle that is the most fun to use as it is all about compatibility that is created through your arrangement. All parts of your design should be in complete harmony with one another. You can do this by adding props or accessories to your design. If you see a floral arrangement that includes a banner and a football, you can easily come to the conclusion through the colour scheme and props that it may be for a homecoming game or a victory. Harmony will lead you directly into unity. By using harmony properly, you can easily create unity as they go hand and hand. The definition of unity is ‘the state of being one, united, or complete’. If your floral design does not contain this principle, it may not feel right to the viewer. You want your design to be seen as a solid piece and not a bunch of different flowers. If your floral design lacks this then it will not be pleasing to the eye or enjoyable to look at. 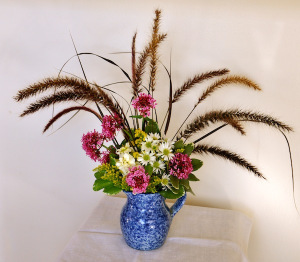 Many may find that these principles are a lot to learn and understand to arrange floral designs, but they are an essential part of forming a beautiful arrangement. If there is a lack of understanding in either the principles or elements of floral design, then your design won’t appear appealing or energetic. While you can have a lot of fun with props to create specific emotions, it is best to ensure that the piece works well with itself and you avoid over doing it. Simple figurines are fine, but if you put more than one or two figurines with your arrangement, you risk moving your focal point and set your arrangement off balance.